(Left) Crowds from Diwali at Times Square in 2016. Diwali comes early in Manhattan. It is considered dismal form to show up at a Diwali party without a hint of Indian sartorial sass. These things become surprisingly important for Indians hosting Diwali parties when they are cut adrift from the mother ship. So everyone pulls out their mothballed Fab India kurtas, gorgeous Jamawar shawls, and carefully preserved silk saris. “I absolutely refuse to wear closed shoes with my sari,” declared my aunt rustling in her restored vintage Banarasi sari when I ran into her at a diplomat’s rumbustious Diwali party at Waterside Plaza. Come September, designer Payal Singhal bails out serial party hoppers who need stunning traditional ensembles by having Diwali trunk shows. She sells her much-in-demand appliquéd mermaid skirts and pastel lehengas through her store in New York’s Gramercy Park. Sometimes an Indian millionaire living in the Hamptons or Westchester simply sends Payal her Diwali party guest list. Payal then outfits everyone for the Diwali party by faxing her designs to her office in Mumbai which stitches and ships back richly embroidered, custom-made Diwali clothes for an undisclosed price. (Left) The street scene during the festivities: India in New York! It has become a New York tradition to celebrate the festival of lights in the brightest place in the city, Times Square. On October 7, Times Square, which is lit up by the world’s first blazing 3D robotic sign and other six-story LED screen digital billboards, will transform into a Diwali mela with Indian stalls. It’s been billed by the promoters as “the biggest Diwali celebration outside of India.” It will brim with Indian food, Bollywood dancing, rangoli painting, traditional diya lighting ceremonies, and a digital fireworks display. Turnout for this marquee event easily reaches 6-figures, making it one of the largest Diwali celebrations in the country. (Left) The sensational dancing king and choreographer Terence Lewis is one of the main draws of the 2017 Diwali at Times Square. The crowds will be treated to performances by India’s dancing king Terence Lewis, one of Bollywood’s go-to choreographers. His unique blend of modern jazz and ballet with classical Indian dance is a style that the country’s biggest stars swear by—as do the thousands of people who take his dance classes. After studying dance at the Alvin Ailey American Dance Theatre in New York and the Martha Graham School of Contemporary Dance in New York, Lewis returned home to India and began teaching classes. One of his students was actress Madhuri Dixit Nene. Since then, Lewis has continued to bring a groovy, Western dance aesthetic to Indian beats. “I’m so thrilled to be coming to this year’s Diwali at Times Square in the heart of New York City,” said singer Hamsika Iyer, whose “Chammak Challo” duet with Akon featuring Kareena Kapoor and Shah Rukh Khan is considered iconic in Indian cinema. Many said there was nowhere else they would want to be during Diwali. (Left) Ranbir Kapoor at a prior year celebration. Bollywood enthusiasts will not be disappointed as actress Sanjeeda Sheikh, model and television actor Aamir Ali, playback singer Raman Mahadevan, and Los Angeles rocker Mickey Singh are going to perform to party anthems. 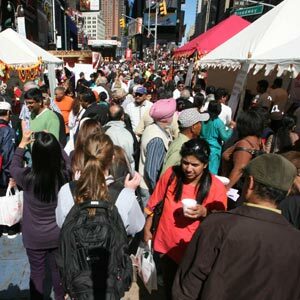 This year’s Time Square event is geared towards raising awareness about Silicon Valley-headquartered Sankara Eye Foundation, which has worked towards eradicating curable blindness in India for the past 18 years. “Diwali is the harbinger of hope and all things good which is why charitable works are encouraged at this time. To fulfill the most important tenets of Diwali, we are pledging to support Sankara Eye Foundation,” said Eventguru founder Neeta Bhasin. An impressive 80:20 free- to paid-patients ratio defines the Sankara Eye Foundation’s working model. They have successfully completed more than 1.6 million surgeries. Diwali is also the season for loafing in New York’s Little India, off Murray Hill, which lights up for the festivities. The stores are a temple of excess with cabinets piled high with mithai. Some mithai sellers put pressure on themselves to be creative. I am still on a sugar high after eating a cloyingly sweet “Tutti-frutti Liberty Mithai Sandwich” stuffed with candied and minced fruits, pistachios, and brandy syrup. (Left) Parineeti Chopra and Aditya Roy Kapur performing at the second Diwali in Times Square, in 2014. Be aware: Little India suffers from personality disorder—it’s at once beguiling, annoying, crowded, and exciting. Pizzerias, Bangladeshi fish-fry restaurants, and South Indian dosa luncheonettes jostle with Punjabi restaurants. The Chinese ones draw motley Indians homesick for spicy Indian-Chinese found in Kolkata’s Tangra region. The restaurants and shops in this stretch are in their busiest time of the year as they keep Manhattan’s tables groaning with Diwali feasts. “Last time we estimated that in the run-up to Diwali we sold up to 1,000 kgs of sweets. And that’s just us. There are dozens of sweet shops on Jackson Heights,” remarked a store owner in Little India who makes barfi and sweets with carrot, topped with chocolate and studded with pistachios. Diwali in Manhattan is Indian in spirit for its generosity and family hug, but it lacks the quintessential Diwali noise found in India. America’s fireworks policy outlaws people living in most U.S. states from bursting firecrackers. Even the traditional Fourth of July fireworks display in Manhattan is plotted to the last pyrotechnic by the administration and sponsored by Macy’s. I live near 9/11-scarred Ground Zero so firecrackers are definitely off limits. A silent Diwali is still very foreign. Half my friends in India envy my enforced silence. Others commiserate. Uttara Choudhury is a New York-based commentator and writer for The Wire and Forbes India.